ChildFund India is Helping to Creating New Readers, One Engrossing book at a time! Five months after the launch of ChildFund India’s Books, My Friends campaign, we’re learning about the children who are getting their first chance to own books and read for pleasure. Last December, ChildFund India launched a nationwide campaign called Books, My Friends to provide bags full of age-appropriate books for 115,000 children, aged 6 to 14 across the country. The goal of the project is to make reading fun for children while helping them improve their reading, comprehension and learning abilities. it is hoped the initiative will create a love of reading that continues through adulthood. In India, ChildFund works with children who live in rural villages and urban slums. Lack of education is a big concern everywhere. Many children living in poverty can’t read at grade level and often don’t have access to books at home. In rural communities, children are often limited to textbooks printed on poor-quality paper. Many parents are barely literate, so a culture of reading has not yet taken hold. Without strong reading comprehension, children can’t excel in school. To address this situation, ChildFund India started the Reading Improvement Program, and the Books, My Friends campaign, which encourages students to read for pleasure. This spring, ChildFund India and its campaign partner, Macmillan Education, conducted a baseline assessment of 1,200 children across 15 Indian states, to understand their reading abilities. About 40,000 children have received books and bags since December through the Books, My Friends program. The analysis showed that reading ability improved with age, although far too many children still can’t read. In the group of 6- to 8-year-olds tested, 66.2 percent were not able to read at all, while 44.8 percent of 11- and 12-year-olds and 29 percent of 13- and 14-year-olds were illiterate. Geography mattered as well, with higher literacy rates in the states of Delhi, Karnataka and Andhra Pradesh, while Rajasthan, Jharkand and Chhattisgarh had lower rates. 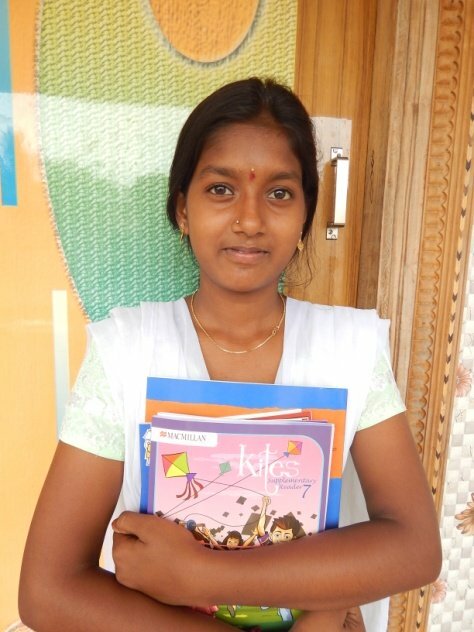 Pooja, a 14 year old girl who lives in a village in Andhra Pradesh, was able to read at the level of an 8- or 9-year-old when she received her books in December. “I wasn’t sure if I’d be able to read these books,” she says. Also, most of her time was spent in studying her textbooks or attending classes, so Pooja preferred to get away from books during her leisure time. But because some of the books she received were in her local language, Telugu, they piqued her interest. Soon, she was enjoying them, and she moved on to the other books in her bag, which were in English. That presented an obstacle, since English is harder for Pooja to read. As a result, Pooja has joined a group of other students who discuss their books. Reading is an important source of knowledge, happiness, pleasure and even courage. It opens your mind and can transport you virtually, into newer worlds. It develops your brain and helps in communicating and sharing ideas, and therefore is essential for advancement and development of any society. We want to plant the seed in children for of a love of books…then watch it grow over the course of their lives, thereby helping to improve literacy and give children better life opportunities. You Are Here: ChildFund Ireland > Blog > ChildFund India is Helping to Creating New Readers, One Engrossing book at a time!